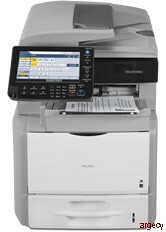 Turn new challenges and everyday demands into cost-saving opportunities- with the flexible RICOH Aficio SP 5210SR multifunctional printer. The powerful system is specifically designed to simplify everyday general office tasks for midsize workgroups. Quickly access exceptional multifunction performance- to complete a wide range of projects faster with incredibly low cost-per-page. Ideal for busier workloads, it offers incredible speed, quality, finishing and intuitive controls to streamline workflow so you can manage your documents more efficiently. * Declared yield values based on ISO/IEC 19752. Actual yields may vary based on types of images printed and other factors. ** Ships with one starter AIO cartridge yielding 6,000 pages. All other consumables ship at full yield. Specifications subject to change without notice. Standard Tray, Standard Sizes: Letter, Legal, Executive, Half Letter, A4, A5, A6, B5, B6, F/GL, Foolscap, Folio; Envelopes: Com10, Monarch, C6, C5, DL. Custom Sizes: Width: 3.86" - 8.5" (98 mm - 216 mm), Length: 5.52" - 14.01" (140 mm - 356 mm). Standard & Optional Tray(s): 14 - 59 lb.